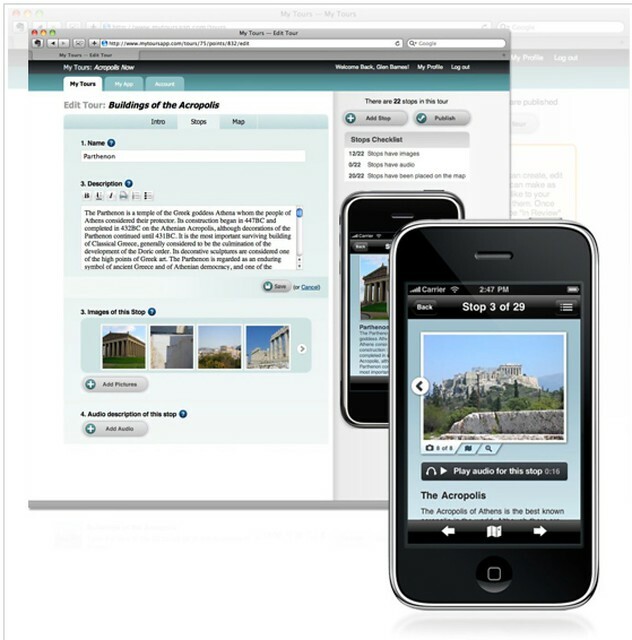 MyTours is a web application what lets tourist authorities, museums and others create city walks and museum tours for iPhone, Windows and Android. We’ve been in business since 2009, and have helped our customers build over 50 different applications, with more in the pipeline. From the start myTours was a company where founder Glen Barnes and the cofounders have put in time rather than money. We’ve seen steady organic growth and now have a small but reasonable bank balance. We see our biggest constraint to growth is the amount of time spent on sales and marketing. So we have just made our first hire, welcoming Lee on board 4 days ago in a sales and marketing role. We are all looking forward to seeing what impact Lee will have, but are confident that he will unleash a steady and growing stream of clients. So while 2012 was a fairly steady year, it did deliver us enough money to make this next step, I anticipate that the 2013 story will be much more fulfilling. If you’d like to create some mobile phone apps from your existing or new contact, then check us out, and get in touch. Thanks for the marvelous posting! Now find some positive work.